There are so many small organizing project that you can do quickly. To give you some ideas of quick projects, I am starting a series of posts that will get you more organized and then maintain the order. Awhile back I wrote about storage ideas for you most used coats. 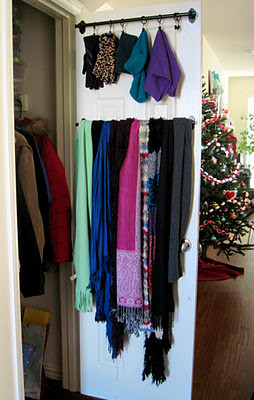 What I didn’t tell you in that post is that we hang most of our coats on hooks out of necessity. Our coat closet is tiny and can’t hold more than 8 coats. Not enough for a family of 4 – forget guest’s coats. 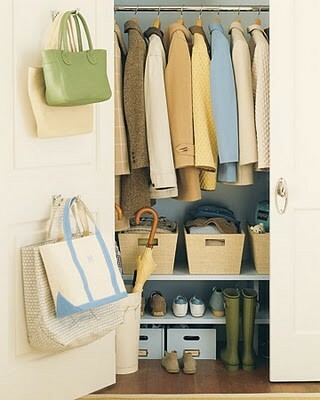 If you are lucky enough to have a large coat closet, organizing it can be a great, quick project. Here are some other great options from Pinterest. This closet from Deliciously Organized makes great use of the floor for storage. Space for shoes, boots, baskets for hats, gloves and scarves. I love it! I also like the way Wayside Sacraments used the back of the closet door to store often used items. A little creativity goes a long way in a small space. Sort, Purge, Group, Contain, Maintain. What’s in your coat closet? Read Tracy’s post for some more ideas. Basic Organization provides professional organizing services to busy families, business owners, down sizing seniors and the chronically disorganized. We can teach you the skills to get organized and live a more simplified life. By providing you with ideas, information, structure and solutions to help you regain control of your space, we can cure the chaos in you life! This entry was posted in Residential Organizing and tagged Coat Storage, DIY, DIY organizing, Inspiration, Organizing a Coat Closet. Bookmark the permalink. We’ve Moved – New Blog – New Web Site – Sign Up!